It’s time to delve into a collection of the best beautiful, premium serif fonts. Serif fonts are ideal for printed literature, more detailed typography, or for creating a more formal effect. And these typefaces really stand out from the crowd. Today, we have gathered more than 100 of the best serif fonts that you can quickly start using in your work. You’ll be amazed at what a difference they can make to your design project, compared to the more generic system fonts that get all too commonly used. There’s nothing like a distinct serif typeface to really set your layout apart, and create something beautiful. Jerrick is a modern serif fonts family that include 6 different typefaces ranging from regular to bold and italics. The font features both uppercase and lowercase letters with multilingual characters. This is an all-rounder font you can use to design everything from greeting cards to logotypes, business cards, and more. Caringin features a mixed modern vintage design that certainly makes it look quite uncommon. It’s an all-caps font that’s perfect for creating headers, titles, and posters. The font also includes alternate characters, ligatures, and swashes as well. This fun and quirky serif font is perfect for designing creating greeting cards and book covers, especially related to kids and fun activities. The font comes with all the standard characters, numbers, and punctuations. Wavetone is a creative serif font that you would use to design a book cover, poster, greeting card, or a flyer. Inspired by classic ads and movie posters, this font comes with a touch of modern design that makes it one of a kind. Thomas Craft features a truly modern design with a clean and minimalist layout. You can use it to design logos, website headers, flyers, and much more. The font comes in 4 different weights. Galvin Slab is a serif font featuring a narrow design. This makes it the perfect choice for crafting greeting cards, posters, flyers, and even T-shirt designs. The font allows you to choose from 8 different weights as well. This is a decorative serif font you can use to create unique book covers and flyers for special events. It’s also great for crafting creative greeting cards and invitations. The font includes lots of alternates and glyphs too. Quixote is the type of serif font you would use to design logos, website headers, and other designs related to luxury brands and corporate companies. It comes with a modern-classic design that just never goes out of style. Samford comes with a clean design making it a great choice for your minimalist website and print design works. It’s available in Solid and Outline styles. Kula comes with a bold serif design that can be used to design attractive titles in posters, website headers, and social media posts. The font is available in 4 different styles, including bold, outline, shadow, and blur. Harold is a modern serif font with an elegant and a minimal design. It’s an all-caps font that also includes numbers and punctuations. It’s perfect for designing minimalist logotypes, badges, website headers, and business cards. Vera is a serif font that comes with the perfect design for crafting logos, business cards, magazine covers, and posters related to luxury brands and products. The font includes multilingual characters with numbers, punctuations, and alternate characters. If you’re looking for a serif font with a unique urban design, this is the perfect font for you. This font is simply ideal for designing logos and branding works related to fashion and luxury products. The font is available in 2 versions. 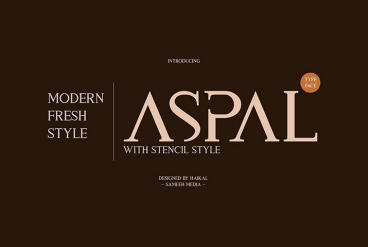 Aspal is an all-caps modern serif font that has a beautiful design for crafting elegant logos and signage. The font comes in both regular and stencil styles, which you can use with different types of design projects. Whimsy is a handmade serif font with a whimsical and a quirky design. It’s perfect for designing book covers, posters, and greeting cards related to kids and teens. You can also use it with online designs and social media posts as well. Croak is a unique serif typeface with a dry withered design. It comes in 2 different styles with a light withered effect and a rough effect. Both typefaces feature all-caps letters, punctuations, and numbers. Portico is a modern vintage serif font that’s ideal for designing posters, website headers, banners, greeting cards, and book covers. The font also comes with web font version as well. Explorer is a serif font family that features 4 different weights, light, medium, regular, and bold. The fonts have minimalist designs that makes them perfect for designing greeting cards, logotypes, posters, product labels, and much more. Deadhead is a playful serif font with a classical design. It comes with an old-school look inspired by the 1960s and includes 300 glyphs, alternate characters, and tilting characters. Fenrir is a serif font with a gothic design. It’s ideal for designing posters and bold titles for website headers. The font includes stylish alternate letters that you can type by using the caps lock. This font will give a unique Victorian-era look to your posters, website headers, labels, and other print designs. It features a blackletter style design with both uppercase and lowercase letters, numbers, and ligatures. Jewel is a classic serif font that features a modern vintage design. It comes in 4 different styles, regular, bold, grunge, and grunge bold. The font is great for crafting logos, business cards, and greeting cards. Farmhand is a family of fonts that include all types of typefaces from serif to sans, inline, and italics. It’s an all-caps typeface that comes with small caps letters for lowercase letters. Morning glory is a modern vintage font created inspired by the culture and fashion from the Victorian era. It also includes a free poster and border vector featuring the same design style as well. Bistro is a two-in-one serif and sans font collection that features a unique handwritten design. It comes in 3 weights, which can be customized with bi-color interior, fill, or slant. It also includes over 50 unique glyphs as well. Minty is a condensed serif font that’s ideal for designing greeting cards, website headers, and logotypes. According to its creator, the font goes well along when combined with a script font. Zahra is the type of font that you can use to craft logos, business cards, and website headers for luxury brands and high-end products. It comes in 4 different styles, regular, regular-grunge, inline, and inline-grunge. A yet another modern vintage font that features a design inspired by vintage posters and with a mix of a few modern aesthetics. It also supports OpenType features and comes with several vector graphics and ornaments. This is a unique font that features a truly stylish hand-lettered design. It also comes in both serif and script versions as well as web font versions. As a bonus, you’ll also get 7 vintage badges as well. Leah Gaviota is a serif font with a fun and corky design, which makes it the perfect choice for blog designs, logos, badges, T-Shirt designs, and more. The font comes in 6 different versions, including decorative, outline, and script typefaces. June Morning is an all-caps hand-drawn display font that’s best for playful and kids-related designs, including book covers and greeting cards. It’s also great for a blog and logo designs as well. Reidfork is a unique serif font that features a mixed modern vintage design. The font comes to you in 3 versions, regular, hand-drawn, and hand-drawn rough. In addition, it also includes a vector pack and a tutorial on how to create a Vintage Textpress design. Venice is a typeface that’s been designed with a mix of minimalism and elegance. The Vogue magazine logo design is the inspiration behind this font. This font looks ideal for designing logos and signage, especially for luxury and fashion related businesses. It comes in both Bold and Regular weights. A great typeface for creating big bold headlines and banners. Morva comes in regular, italic, and ornament versions. Isabel typeface has been designed for creating all-things related to children and teenagers. However, the font design looks perfect for crafting many other types of designs as well. Give your logo, headline, and print designs an American wild west look with this stylish typeface. It comes with Opentype features, alternate upper and lowercase characters, and supports international languages. An elegant serif typeface suitable for all modern logo, headline, web design, and print designs. The vintage design of this font makes it a great choice for designing cards, invitations, and website headlines. The font comes in 8 different styles including, regular and grunge, inline and inline grunge, and more. This minimalist font is designed for creating bold headlines and logos with all-caps letters. It comes in light, regular, bold, and black weights. A fun and a beautiful serif font for all your designs related to kids. The font pack comes in three different alphabets, including extra-tall, extra-short, and extra-swirly letters, which allows you to create your own unique designs. This calligraphy style font with quirky letters gives its letters a unique handmade look. It will play well with many types of your design needs. Featuring a special bracketed serif shape and a beautiful swirl ornaments, this font is ideal for designing logos and headlines for fashion and luxury brands. Yet another fun and a unique typeface with a handmade look for all your exciting and enjoyable projects. This typeface will probably remind you of a dark horror movie. But it looks great for headers, logos, and print designs as well. This handmade-style font with a vintage design is perfect for designing posters, cards, logos, and more. This is a premium quality and a unique font that’s been designed inspired by antique 18th-century printers’ specimens. It can be used for designing cards, invitations, and even for the pages of children’s books. A vintage-style typeface with a mid-eighteenth-century design for crafting stylish logos, posters, and headers. Another beautiful typeface with handwritten letters. The font is perfect for crafting graphics, posters, headers, and even quote photos for social media. This hand-drawn font is inspired by “shady dealings, nefarious henchmen and ghost stories”. According to its creator, it’s suitable for tattoos, death threat, ransom note, wanted sign, and tombstone designs. Inspired by classic letterforms carved into stone, this typeface comes with a full European character set and 410 glyphs. It’s ideal for headlines, logos, branding, and many other designs. This fun and cheerful hand-drawn serif typeface will fit in perfectly with your invitation, cards, headers, and even for children’s book covers. For the better part of 2015 I spent my type design time on Flabbergast, a Didone for headlines with wide language support. After creating all of the design for my game assumptions using Didot, I felt inspired to create an even higher contrast font, for print and web. I set out only to make one weight (regular) but fell in love with even heavier verticals and added a bold weight. It was released in November of 2015 and the download includes OTF files for the regular and bold weights, as well as webfont kits for each. Introducing Young Heart Typeface – a western style display font. OpenType features with Stylistic Alternates. To access the alternate glyphs, you need a program that supports OpenType features such as Adobe Illustrator CS and Adobe Indesign. You can use this font for various purposes such as logo, t-shirt design, posters, labels, letterheads, book covers and more. Dashing and expressive, with an overstated x‑height and evocative letter­forms. True italics and lots of character. Featured on Typography Served, Argent is both a tribute to the past and a step into the future of typography. Turquoise contains small caps, many discretionary ligatures, ornaments, swashes as well as several brushy nature-inspired ornaments, accessible via Opentype. Ideally suited for headlines or body text in advertising, packaging and visual identities, its delicate shapes, curves and endings give projects a harmonious elegance and stylistic feel in unique turquoise style. Quincy’s warm, flowing letterforms, tall x-height and medium contrast provide a pleasant reading experience for longer passages. Quincy also doubles as a stately display font. Five weights and true italics ensure versatility, with a compliment of Latin and Cyrillic alphabets for good measure. A serif font in two styles: regular & italic, and in 2 weights. With over 550 glyphs for each font, including: A-Z, a-z, 0-9, punctuation marks, accents, small caps, ligatures, and much more. Victorian Parlor is a traditional victorian decoration typeface based on clean looks and ink textured. Containing 350 glyphs of clean looks (regular font) and 350 glyphs of ink textured (vintage font). Each letter in the font was painted manually one by one with lots of detail and consistency. Built to withstand the challenge of trends and time. Inspired from the graphing technique of the late Sir Raymond DaBoll but with markers, acrylics and digital touches to create balance among heights and spacing. Call it modern vintage. Changing the size and kerning were made automatic for a perfect combination. Endurest in short is perfect for your work. Caston is a revival typeface based on Morris Fuller Benton’s modified litho – initially designed and issued by Inland Type Foundry back in 1907, later modified and issued by American Type Founders in 1917 after the merge. Not only the typeface is now in the hands of public domain due to the defunct of ATF decade ago & lacking of active descendants – no known digital font was found in the web, until now. This font is mainly inspired from the engraved characters of a German Map depicting Germany’s roads and parts of surrounding lands, edited in Berlin probably in the end of 1700’s. The engraver was Carl Jaeck or Jaek (1763-1808). The Map was bought by the French napoleonic general Louis Pierre Delosme (1768-1828) probably during the Napolenic campaign against Germany, circa 1805 or at least 1806, his sole staying in Germany. Naïve Inline is a serif handwritten font designed by Fanny Coulez and Julien Saurin for La Goupil Paris. The three weights of this retro-Parisian typography can be enhanced with a bicolor interior, ribbed, full or demi, to improve your designs and bring a nostalgic and unusual feeling. To do so, you can simply superimpose the 2 elements: the weight above, the interior below. We also designed a sans serif version, Naive Inline Sans. Naïve is a serif handwritten font designed by Fanny Coulez and Julien Saurin from the french foundry La Goupil Paris. The three weights of this new parisian typography can be enhanced with three weights of two alternates fancy glyphs for each letter, the “Fantaisies”, to improve your designs and bring a more poetic and unusual feeling. It’s no secret that I love all things hand-lettered, but recently, I also can’t get enough of letterpress printing! And with all the gorgeous script fonts in the marketplace, I wanted to create a fun typeface to compliment them. But of course, I couldn’t stop with just a font. Nope, I went ahead and hand-sketched over 300 vector elements, added 10 cotton paper textures, and designed 50 Letterpress Styles, so that you can make anything and everything you want. This elegant and versatile serif typeface captures the essence of classic and modern city, the dualism between the working class and the city planners. Through the elegant lines and sinuous curves this font works perfectly for a display reading or beautifully as a headline or as body copy. A vintage style display serif font for your new projects. Great for your retro/vintage projects, the pack contains 4 font files (otf & ttf) – regular, grunge & line, and line grunge. Sonten Typeface is a modern serif-semibold for title and bodytext in a medium look. The name ‘Sonten’ originally from Sundanese word means ‘Afternoon’ that inspired from the process when I created the font every afternoon after my “business” done everyday. The design prefers to use in insignia style, so I presented the different styles including 3D, Bevel, Contour, Deboss, Outline, and Shadow. Most of them can texted in a regular way (1 color) or being combined by 2 font that have the same position like a multi-layers. Introducing western style display typeface it’s a alitide. An All-caps font with modern western style, OpenType features with stylistic alternates. To access the alternat glyphs, you need a program that supports OpenType features such as Adobe Illustrator CS and Adobe Indesign. You can use this font for various purposes such as logo design, t-shirts, posters, and much more. A handcrafted serif font by Jackrabbit Creative. Inspired by elegant cityscapes. Tigerlily brings a handmade feel to an otherwise “sophisticated” feeling typeface. Font comes as both .ttf and .otf font files. Includes numbers and basic punctuation. Introducing the new Colombos Typeface, another display serif font. It is a great idea to use it for logos, inspirational quotes, t-shirt graphics, typography art, apparel, labels, badges, posters, business cards, stylized wedding invitations, prints, signs, emblems, book cover designs headlines, titles, etc. Alice is a fun and quirky all caps serif font. While creating this font, all I could think about was Alice in Wonderland and her adventures. Comes in 2 weights; Regular & Light and includes OTF and TTF files. Introducing Bold Riley a handmade serif display typeface. To give it that human touch each glyph was hand drawn with pen and ink. St. Monique is a display typeface inspired by medieval typography and visual motifs. Serifs and subtle details were designed to evoke the medieval feeling while keeping the typeface clean and contemporary. Black oval is a font with a vintage style and simple, very suitable for your brand or posters, band, shirts and others. The death cross vintage font is very similar font can help in your work with designs — especially vintage designs. Nadirii Font is a handwritten, multilingual, display font, with greek/greek polytonic and latin characters. Introducing Floren Typeface, a simple and beautiful font made with persistence and passion. Floren typeface has a unique character when compared with its peers — it has a unique, special bracketed serif shape. Just outline the stroke instead of trying to maneuver letters with tracking and kearning. Those swirls are ruthless. A beautiful font for you to use in your designs. This family was inspired by the pure Garamond pattern set of fonts used by Egenolff and Berner, German printers in Frankfurt, at the end of the sixteenth century. All the experts said it was the best and most complete set of the time. The italic style used with it was Granjon’s, as in 1543 Humane Jenson. A few fleurons from the same printers have been added. Introducing Marthas, The time-machine between that classic wave typeface and nowadays vintage enthusiasm. Inspired by vintage hipster enthusiasm, the needs of classic fonts are raising high for any industries that bring the trend as their red carpet to attract the market. So that’s what the Marthas was based on. It comes with a complete set of Uppercase, Lowercase, Numbers, Accents and Punctuations. Corporative Condensed, by Latinotype Team, is the narrowed version of Corporative Basic that offers high performance when using for headings and subheadings. The family consists of 8 weights plus companion italics. This is a hand drawn, all caps display typeface inspired by classic letterforms that have been carved into stone and then weathered by time. Introducing Bold Riley, a handmade serif display typeface. To give it that human touch each glyph was hand drawn with pen and ink. This typography was designed for continuous text, legible at medium and small sizes, with great saving of space, optimized for 6, 8, 10 and 12 points. The morphology is a mix between tradition and innovation; it has a vertical axis, thick serifs, tall x-height, light modulation and a lot of internal space between letters: key to improve legibility at small sizes. Formally, my idea was to make a serif type that had a unique color, this is visible due to the light modulation. This is also complemented with the incorporation of not common, alternative signs. Some parts of the letters that are usually curb or diagonal where made horizontal (for example: a, q, p, etc. ), this makes the eye of each character to be wide and unique. Vidiz Pro Typeface is serif font designed to help you create stunning work. Suitable for logos, posters, invitations, greeting cards, quotes — you name it. Real Talk packs the same lip flapping smacks and pharyngeal grunts as any old nonsense. But while a baby can only babble, a grown man can mean something. Put words in perspective, located on the axes of breadth and depth, and live by them. Do what you say. Say what you know. Know what you feel. Archive Garamond is a typeface roughly based on the designs of Claude Garamond (ca. 1480 – 1561) , a French publisher and a leading typeface designer of that period. While the majority of contemporary digital interpretations of the “Garamond types” are cleaner and more polished versions of that genre, Archive Garamond tries to keep the rough nature which was typical in the early days of printing. Archive Garamond has a rather unique, distinctive temperament which is even more emphasised with the preserved non-uniformity, such as irregular glyph shapes or a variable baseline. Although Archive Garamond was clearly made to be used for display sizes it works surprisingly well in text. Rudolf Gagarin is part of the Gagarin Family. Made by Novo Typo. Designers from Amsterdam, The Netherlands. Karl Whitefoot is a hand drawn font that comes in two different variations, regular and oblique. You can combine the different styles of the whole Karl family to make variations to your design. It’s my hand-drawn font, Daisy Dog. Created in some of my favorite hand lettering that I always find myself including with my illustrations and surface patterns, I wanted to share it with the world. AZ Vintage Tattoo font was inspired from Early 1900’s Amateur tattoos. This font utilizes an “old look” to the line work which is designed to have a “worn feel” to it. Ideal for use as headline or sub-head text in you design. A handmade, Brave New Font sketchy, illustrated, and hand-drawn with love. This is more than just a typeface – this is a pack, and it allows you to be even more creative than you would have been with just the font. Opentype features ready with Stylistic Set, Contextual alternates. With Opentype features you can applied to logos, product, display, clothing, quotes and many more. You can applied to all typography with mix and match pairs of letters to fit your own designs. After many hours with my pen and sketchpad my first font has finally landed. Taken from one of my hand lettering styles which regularly features on my Instagram and Dribbble feeds, it is inspired by the love of vintage, the outdoors and a time when everything was made by hand. Dacota Typeface is a layered type family, Inspired by vintage american west poster and circus poster that have a strong shapes so it will create more attention for people to look more closely. Comes with 4 font system that can be layered to create different effect (basic, rough , dropline & dropshadow). Dacota Typeface includes a full set of capital and lowercase letters, as well as multi-lingual support, currency figures, numerals, and punctuation. “Carrig Refined” is the polished version of Carrig Rough. I have taken the essence and personality of my original hand drawn typeface and refined it. Carrig’s clean, curved lines, uniform serifs and precise kerning combine to make a unique, distinctive typeface that could be the perfect solution for your next design project. Champloo is very unique typeface which combines serif features and brush stroke. Some letters have serif, but some don’t. Serif to be found on left side of stem only. It gives a quirky impression on short text. However the larger the text become, the more consistent look it gets as a whole. These two versatile weights let you play with the typeface freely and beautifully. Introducing Udang Typeface classic display font. Inspired by victorian style which is combining classic and modern typography. You can applied to all typography with mix and match pairs of letters to fit your own designs. Claire is a handwritten font created by brush and ink which gives it sharp edges and a little bit scary look. It is delivered with over one houndred thematic illustrations. So, if you’re looking for something sharp but pleasant you are on the right way. This font is specifically designed with a variety of alternate, ideal for posters, t shirts, typography, writing etc. Hand-drawn font based on an old Underwood typewriter (hence the limited character set). A contemporary fun font that would be ideal for funky designs and graphics. A simple, yet elegant, handwritten font. It will be ideal for minimal or typographic poster designs. Inspired by vintage fifties and sixties design elements. The lettering features exaggerated angles with the square borders popular at the time. All letters are capitals but the lowercase characters provide variations. This package includes an additional font containing only the letters without the borders. This font supports basic Latin and Western European diacritics and the download contains both TTF (True Type Font) and OTF (Open Type Font) files. AZ Plug Italic font is inspired from a combination of original early 1900’s Edward Penfield and Franz Hazenplug poster art. This font is designed for use as a worn and antiqued headline or subheadline. Teco Serif is a simple and modest display font design. It supports a wide variety of languages — Albanian, Cyrillic, Danish, Dutch, English, Estonian, Faroese, French, German, Icelandic, Italian, Malagasy, Norwegian, and Swedish. This font was inspired by a song titled “Hoods & Capers” by Asteria. Introducing Victoria. Available in Regular And Bold. A modern serif font with a nice medieval outlook that will bring out the true vintage nature of your designs. Aviano Wedge comes in six different weights and is packed with OpenType features. As a complement to these characters, Aviano Wedge includes 40 discretionary ligatures for artistic typographic compositions. To see these features in action, please see the informative .pdf brochure. OpenType capable applications such as Quark or the Adobe Creative suite can take full advantage of the automatically replacing ligatures and alternates. Aviano Wedge also includes support for all Western European languages. Mekicki is a typeface based on a poster designed in 1928 by Polish artist Rudolf Mękicki. It is part of a series inspired by the aesthetics of Poland, circa 1908 to 1939. Heirloom Artcraft is available in Thin, Thin Italic, Book, Book Italic, Demi Italic, Black, and Black Italic. It also features Metrics and Optical kerning– metrics displays characters with letterpress-traditional spacing that is pleasantly askew, or more rigid optical kerning which displays characters at identical distances for times when the importance of readability exceeds that of stylistic merit. With its round and elegant shapes, this new didone typeface is developed in six styles, including a “poster” weight. Though inspired by classical thick and thin shapes, Exquise FY’s design is innovative with its sharp drops. There is something special about thin fonts. On one side is the sensitive, charming and warm touch, on other side they are uncompromising, thoroughgoing. Here the contrast can’t hide the clear shapes. Hilton Serif and Hilton Sans is a pair of highly legible, subtle and elegant sans-serif and semi-serif display faces. The quality of spacing and kerning ensured by Igino Marini. Skooled Serif is a clean hand drawn font face that is perfect for creating a handmade look on your website. The text is easy to read, even at smaller sizes. The download includes all of the formats needed to embed the font in your webpage. The font features 195 glyphs including accented characters. Marker is an all caps, this is my my first typeface using fontographer, i think marker its good for your headline. This unique art font comes with new set of ornaments as well as many ligatures and Zodiac signs. MARINA is typeface inspired by sea, sailing, boats and wind. Enjoy the seashore. nspired by Renaissance typefaces, Gauthier FY is a contemporary old-style serif typeface with big x-heights and quite small caps. Accompanied by a lovely and detailed italic, inspired by artworks from the punchcutter Granjon‚ Gauthier FY is perfect for any text design. Gauthier was co-created by Jérémie Hornus & Alisa Nowak on fontyou.com, the first collaborative type foundry. Bosman_empty is perfect font for apparel, labels posters with vintage, marine feel. Package contains also Bosman_dings. Unlike many of our other fonts that are strict interpretations of historical exemplars, Old Venexia is a loose interpretation of Aldus Manutius’s typefaces. Aldus was one of the greats in typography whose work influences vast amounts of typefaces to this day. This font has nearly 600 defined characters. Suitable for a wide variety of applications. This font contains regular, italic, bold, bold italic and small caps in both TTF and OTF formats. Every Proportional Lime font comes with a full character map. “Brush Serif” was inspired by all the classic serifs you know and love, but as an illustrator I’m not enthused with straight lines and perfect corners. Every font was styled off of one or more “classic” typefaces and completely redrawn and hand painted with a Chinese calligraphy brush and Indian Ink. The Full family. Much love, Ed. These are as versatile as they look but are particularly striking at large sizes when all of their beautiful imperfections, dry brush edges and speckled fills are visible. A unique dusty font inspired by the American dust bowl during 1930 – 1940. Australis is a hybrid roman font that won first prize in the Morisawa International Type Design Competition in 2002. After 10 years the family is finally complete and its release coincides with the reopening of the competition in 2012, in Japan. Caitiff is a unique hand drawn serif. It includes about 25 ornaments to compliment your text and a couple of stylistic alternatives to your capital letters. Caitiff Slanted is an oblique version of Caitiff. Caitiff is a decorative typeface. You can use Caitiff in any setting; children’s books, beer labels, organic food packages and menu. Sergio FY is an antique latin font family inspired by a 19th century wooden type font, found in an italian print – Gazetta Musicale di Milano, 10 Guigno 1897. This typeface is characterized by its large, sharp, and triangular serifs, which give it a very singular look. With its complete character set including small caps, oldstyle figures and discretionary ligatures (amongst others), Sergio FY comes with 3 weights and italics, as well as an amazing set of ornaments. Its large width, its short ascendants and descendants allow it to perfectly fit in small size. It will also show all its originality in big sizes for headlines or posters (absolutely fabulous in its black version). Both robust and elegant, spiky and friendly, oldschool and contemporary. Sergio FY is for sure the next celebritype. Sperling FY is a geometric and condensed high contrast font, characterized by its long vertical serifs. Its big i-dot as well as some other deliberately naive disproportions like the W are wonderful signs to identify Sperling FY. The accompanying italic style illustrates well designed creative forms like the k or the z. Due to its good legibility in small size, you can use it for editorial texts like in magazines. You can also take great pleasure by using it in poster size. Canberra FY is a contemporary and low-contrast serif typeface that shows legibility with personality. Its asymmetric and short serifs render a versatile look, always usable and friendly. Rocking Bones is Serif Handdrawn like a Bone with handmade feel. You can use this font as creative as you want. Just imagine and touch the sky. Mayonez is a typeface with rational structure and axis but softened with rounded contours and cupped serifs, getting as result a balance between seriousness and friendliness. The shapes have a soft appearance but without lacking definition. I like typewriters. Heres two handwritten fonts inspired by them, regular and bold. Download includes two .TTF files compatible on both Mac & Windows. This is Bonerica typeface is serif font made by hand. This is good for logo,greeting cards, posters, labels, t-shirt design, modern vintage, etc. Boucherie Block is part of the Boucherie Collection – a series of 16 distinct, yet related typefaces. With its thick wedge serifs and steeply angled crossbars and terminals, Boucherie Block cuts a bold impression. Set it large and tight for searingly effective headlines. This Slab serif typeface is characterized by its curved and angular serifs which give it a special character. Not too rigid, no too round, its well balanced shapes make itself both legible in small size and powerful in big for headlines, with its robust structure. Introducing murmers typeface is a serif font . murmers typeface inspired by old films about a murder or crime . This is a great for vintage design, t-shirt, logo, labels, posters , badges and etc. Brington font made with a mixture of ornament adds a classic and vintage. very well suited to be used for book titles, bands, movies, advertising etc. Piramid Font is suitable for use make design using style of racing. This font is also used a great vintage style used in your design that has a vintage concept. As its cousin Hansom FY, this font has friendly shapes and rounded terminals. Slabs reinforce its masculin and technique appearance. With 3 weights and their accompanying italics, this modern and functional slab font family is well-suited for all kind of application. From packaging to editorial design, from screen to branding – Hansom Slab FY guarantees optimal readability. Holly Serif is a handwritten font in the style of type with a flair of the handwritten. It contains language characters for European languages and comes in 2 styles. Earlier this year I visited a bakery in Newport Beach, CA and fell in love with the organic design and typography of the place. Hand-drawn menus, table cards, chalkboards, and wall quotes surrounded the charming spot. It inspired me to create a new font family based on the combination of hand drawn fonts. This typewriter inspired hand-drawn font family works great as either a display or paragraph text. It has contextual alternatives with 3 versions of each letter, and comes in both upright and custom italics versions. A Gentleman Rascal of a font. Serious but fun. Responsible but quirky. He is good enough to meet your parents and your friends. He has your back in a fight and adds class to your dinner parties. This is our series of beautiful, inspiring collections of fonts and typefaces. These articles feature bold poster fonts, decorative scripts, and everything in-between! Find the perfect font for your next design project with one of these collections. Roshan is a blogger and a freelance writer with years of experience in digital marketing, web design, and UXD. He also loves to code websites in his free time.